In 1819, Kalanimōkū was the first Hawaiian Chief to be formally baptized a Catholic, aboard the French ship Uranie. “The captain and the clergyman asked Young what Ka-lani-moku’s rank was, and upon being told that he was the chief counselor (kuhina nui) and a wise, kind, and careful man, they baptized him into the Catholic Church” (Kamakau). Shortly thereafter, Boki, Kalanimoku’s brother (and Governor of Oʻahu) was baptized. It wasn’t until July 7, 1827, however, that the pioneer French Catholic mission arrived in Honolulu. It consisted of three priests of the Order of the Sacred Hearts of Jesus and Mary; Father Alexis Bachelot, Abraham Armand and Patrick Short. They were supported by a half dozen other Frenchmen. Their first mass was celebrated a week later on Bastille Day, July 14, and a baptism was given on November 30, to a child of Don Francisco de Paula Marin. The American Congregationalists encouraged a policy preventing the establishment of a Catholic presence in Hawaiʻi. Catholic priests were forcibly expelled from the Islands in 1831. In 1837, two other Catholic priests arrived. However the Hawaiian government forced them back onto a ship. American, British and French officials in Hawaii intervened and persuaded the king to allow the priests to return to shore. One of the priests expelled in 1837 was Rev. Louis Désiré Maigret. Born September 14, 1804 in Maille, France, at the age of 24, Maigret was ordained to the priesthood as a member of the Congregation of the Sacred Hearts of Jesus and Mary on September 23, 1828. On June 17, 1839, King Kamehameha III issued the Edict of Toleration permitting religious freedom for Catholics. However, when the Vicar Apostolic of Oriental Oceania was lost at sea, Father Maigret was appointed the first Vicar Apostolic of the Sandwich Islands (now the Roman Catholic Diocese of Honolulu.) They sought to expand the Catholic presence. Maigret oversaw the construction of what would become his most lasting legacy, the Cathedral of Our Lady of Peace, still standing and in use in downtown Honolulu. 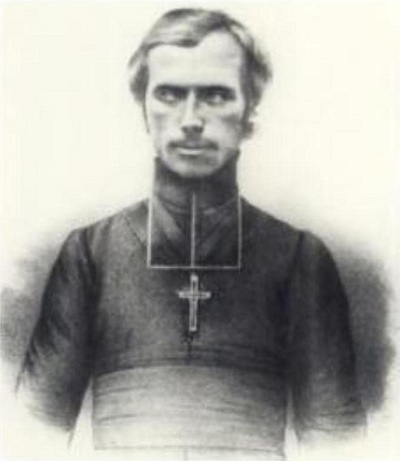 Maigret was officially ordained as a Bishop on November 28, 1847. Bishop Maigret died on June 11, 1882, after 42 years of service in Hawaiʻi, 35 of those years as a Bishop. He is buried in a crypt below the Cathedral of Our Lady of Peace. The image shows Louis Désiré Maigret. In addition, I have added other images in a folder of like name in the Photos section on my Facebook and Google+ pages. On June 17, 1839, King Kamehameha III issued the Edict of Toleration permitting religious freedom for Catholics in the same way as it had been granted to the Protestants. In 1841, Father Louis Maigret, the Vicar delegate, divided Oʻahu into missionary districts. Father Martial Jan was assigned to supervise the Koʻolau district. By the early 1850s, the windward coast of Oʻahu was dotted with chapels. The Sacred Hearts Father’s College of Ahuimanu was founded on the Windward side of Oʻahu in 1846 by the Catholic Mission under the direction of the Fathers of the Sacred Hearts of Jesus and Mary. One of its students, Damien (born as Jozef de Veuster,) arrived in Hawaiʻi on March 9, 1864, at the time a 24-year-old choirboy. Determined to become a priest, he had the remainder of his schooling the College of Ahuimanu. On May 21, Damien was ordained a priest at the Cathedral of Our Lady of Peace in downtown Honolulu; he spent the rest of his life in Hawaiʻi. In 2009, Father Damien was canonized by Pope Benedict XVI. In 1881, the school moved to its second location in former Rev. Richard Armstrong’s home, ”Stonehouse” (named after the residence of Admiral Richard Thomas in England,) on 91 Beretania Street adjoining Washington Place. At that time, the name “College of St. Louis” was given to the institution in honor of Bishop Louis Maigret’s patron Saint, Louis IX. Growing enrollment soon required the Mission Fathers to relocate the school, again; this time, they found a site on the banks of Nuʻuanu Stream. The College at Aʻala was placed under the direction of five pioneer Brothers of Mary who arrived from Dayton, Ohio in 1883. St Louis continued to be affiliated with the Society of Mary, a religious order of brothers and priests called Marianists. The Society was founded by Blessed William Joseph Chaminade, a priest who survived the anti-clerical persecution during the French Revolution. In the years following, it became evident that the elementary and high school departments were in need of still larger quarters. Encouraged by parents and alumni, the Marianists laid plans for a greater St. Louis College. 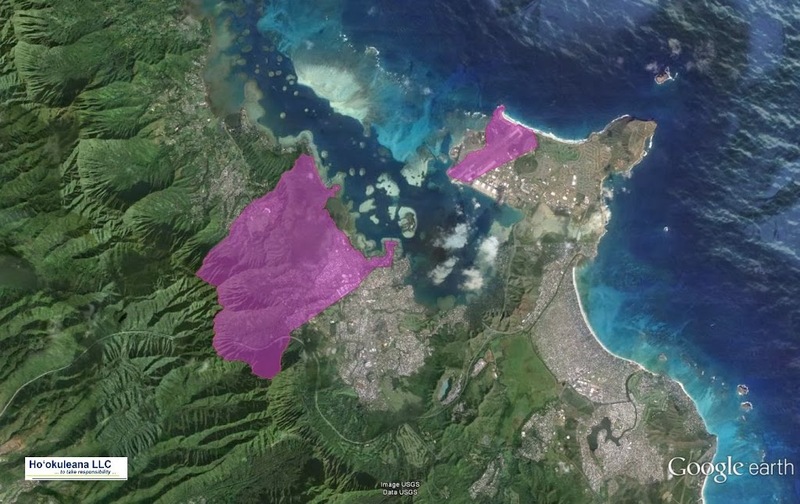 In 1923, they purchased 205 acres at Kalaepōhaku in Kaimuki; classes began there in 1928. December 8, 1941 the US Government commandeered the campus for the use of the 147th General Hospital. Elementary students attended classes at Saint Patrick School and high school classes co-located at McKinley High School. After sixty-seven-years of providing education at grade levels one through twelve, the elementary and intermediate grades were withdrawn one-grade-a-year, beginning in 1950. St. Louis’ high school classes continued on campus until 1979, when the school’s Board of Trustees voted to re-incorporate intermediate grades seven and eight, beginning in fall, 1980. A sixth grade was added and the intermediate grades were then converted to a middle school beginning with the fall semester of 1990. 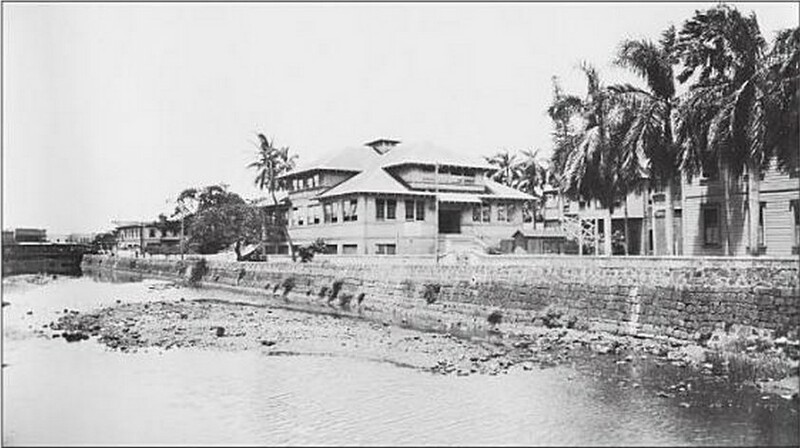 The image shows St Louis College at its Aʻala facility at College Walk on Nuʻuanu Stream. In addition, I have added some related images in a folder of like name in the Photos section on my Facebook and Google+ pages.